Focusing on the album of poetry and woodcuts called Sounds (Klänge), published c.1912, this paper examines how Kandinsky understood and exploited the relationship between text and image. It shows how he conceived of the album as an example of synthetic art and explores the broader principles underlying his idea of artistic synthesis. In 1938 Wassily Kandinsky published the text ‘My Woodcuts’ in the French periodical XXe Siècle. As was so often the case, when he wrote about his prints he focused largely on general artistic principles: the majority of the text is devoted to a general discussion of the need to privilege ‘synthesis’ over ‘analysis’ in both art and in life. 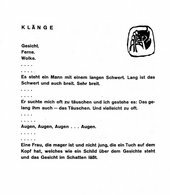 However, he specifically referred to the album of poetry and engravings Sounds (Klänge), which had been published in Munich c.1912, as ‘a small example of synthetic work’,1 and it is this aspect of the album that is the subject of this article. Sounds comprised thirty-eight prose poems which were accompanied by twelve colour and forty-four black and white woodcuts, each hand-printed under Kandinsky’s supervision. It was published in an edition of 345 c.1912 (it was scheduled to be published in autumn of that year but the exact date of its appearance remains uncertain). The page shown in fig.1 contains a title (‘Klänge’, the same as the title of the album), most of the poem (which continues onto the next page) and a woodcut. The poems contained in the album were written between 1909 and 1911. They draw attention to and manipulate the sounds of words in such a way as to destabilise their conventional meanings. ‘Words’, Kandinsky wrote in On the Spiritual in Art, ‘are inner sounds … Skilful use of a word (according to poetic feeling) – an internally necessary repetition of a word twice, three times – can lead [to] unrealised spiritual qualities of the word. Eventually, manifold repetition … makes it lose its external sense as a name’.11 With this quest for ‘inner meaning’, ‘great possibilities open up for the literature of the future’ as language breaks from the constraints of its traditional usage. As we read the poems, acoustic rhythms couple with spatial ones to halt our progress through them: we find ourselves re-reading, our eyes moving around the poems, attempting to re-engage or re-enter the works. The sound of the words and the unconventional spacing of words across the page, as well as the remnants of narrative, both ‘articulate’ and ‘dis-articulate’ the whole. The process of re-reading and moving visually around the poem seems to make the text more open: syntax and narrative are lost; the spaces between and beyond words, lines and stanzas, appear to threaten the unity of the text; and – according to Kandinsky’s claims – the words may evoke psychological, synaesthetic or even spiritual associations beyond their literal meanings. Four of the woodcuts in Sounds were produced in 1907, forty-seven in 1911 and the remaining five in 1912. Over this period they became increasingly abstract, though careful attention allows us to recognise, in most, references to the corporeal world. Nonetheless, what has just been said of the poems applies equally to the prints: narrative and conventional meaning is largely lost as abstracted form dominates. Again, we are denied access to the work on familiar terms, and we are forced, once more, to move into and out from the forms and spaces between them in search of meaning. Through this process of engagement and refusal of our attention, both text and print repeatedly attract and repel the viewer. We move from exploration of one to exploration of the other. In this way, the prints begin to enter the space of the texts as the texts begin to enter the space of the prints. The common white ground upon which both text and print stand, as figure, is the medium which articulates these intrusions. In this, Kandinsky aimed to overcome the relationship between text and image where one serves as explanation, or illustration, of the other. In his art theory, Kandinsky offered clues as to how he intended the interrelations between these quite separate, yet now mutually implicated, art forms to be understood. In the 1912 essay ‘On the Question of Form’, Kandinsky pays particular attention to the function of a letter and of a dash. The text offers a dash, ‘used in the right place – as here – …’12 identifying it as practical and purposive. He then suggests we lengthen the line while leaving it in the same place. The sense of the line remains, he tells us, as does its significance; yet, the line now takes on an ‘indefinable coloration’ that called the line’s function as a hyphen into question.13 In the wrong place, ‘(as in this – instance)’, this uncertainty increases. ‘As long as this or that line remains in a book, the practical or purposeful element cannot be definitely excluded.’14 The move to a canvas, he suggests, begins to resolve this uncertainty as the line may become ‘pure’, but as long as the line remains in a book, the practical-purposive element cannot be fully excluded. On a clean sheet of paper suddenly obtains a second graphic sign, a second graphic entity ————————– line. From these two elements, point and line, Kandinsky writes, we derive the entire resources of a whole realm of art – graphics. But Kandinsky does not situate his line on a clean sheet as he suggests and, in his ‘illustration’, maintains the line’s function as a hyphen – it leads from the sentence’s description to the naming of its object. It is a graphic element within the text itself and thus, as identified in ‘On the Question of Form’, remains ‘within a book’ and therefore ambiguous. Kandinsky begins to enjoy this ambiguity. The point is transferred from its practical, purposive state into one that is nonpurposive, i.e., alogical. Today I am going to the cinema. The point is divorced from its practical, purposive state, so that it stands outside the sequential chain of the sentence. He writes that the point here requires a larger empty space around it, allowing its sound to ‘resonate’. The larger the point and the smaller the text, the more the sound of the point is ‘audible’ and clear. At this juncture, he refers to a figure in the text. The first figure in his text (fig.2) is a point, now divorced from the sentence to which it had been attached (‘Today I am going to the cinema’). Like the ‘sample text’ above it, the text which supposedly stands apart from the first illustration is, in fact, part of the illustration: it is the relationship between the two which is being illustrated or, rather, performed. Kandinsky no longer gestures outside the text to suggest that the graphic element appears in the pure context of a blank page or canvas; outside of the text, the relations he has been describing, and thus the tensions and ambiguity created, would be lost. Instead, it is precisely the point’s relational – and thus unstable – status that intrigues Kandinsky. What is both described and performed through the passage is the tension between the textual and artistic functions of the graphic element. Kandinsky thought that his analysis of the graphic qualities of conventional writing contained clues as to how to think the relations between text and image in Sounds. In a letter of 1911 to Michael Sadleir, who published Concerning the Spiritual in Art in 1914, he wrote that there was both an inner and an outer relationship between the texts and the woodcuts: ‘I treat the word, the sentence in a very similar way to that in which I treat the line, the spot.’17 But Sounds is more complex than the passages we have just followed in Kandinsky’s theoretical texts. 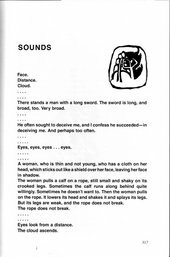 In Sounds, words in the poems function conventionally and, simultaneously, move toward free graphic form, becoming abstract. At the same time, the images in the album are representational and, simultaneously, move toward free graphic form, becoming abstract. Each of these moments Kandinsky describes as a Doppelklang18 – a neologism to describe an entity that is a double-sound or chord consisting of quite contrary elements. To this already complex process, we must add the third tension in which text as poem and image as vignette distinguish each from the other, and yet continuity between poem and vignette is established as free graphic form. The white paper upon which each of these tensions stands is the ground that now becomes a battleground on which continuity and conflict are acted out. This instability is important to Kandinsky, and is further developed in his writings. The 1926 passage on point describes the point as a break in writing, a ‘symbol for interruption, for non-being (negative element)’ and as a ‘bridge from one entity to the next (positive element)’. The point functions simultaneously as disjunction and as conjunction. This contradictory formulation is underscored by the assertion that the ‘sound of silence habitually associated with the point is so deafening that it drowns all its other qualities.’19 Describing the moment of transition from the point’s status as punctuation to a purely graphic element, Kandinsky writes at the end of the passage: ‘Thus, a chord is sounded [So entsteht ein Zweiklang] – writing-point – … It is the balancing of two worlds that can never attain equilibrium.’20 It was a ‘purposeless revolutionary state’. Zweiklang (literally, a ‘two-sound’) is a word Kandinsky uses repeatedly, along with Doppelklang and Dreiklang (a ‘three-sound’ or triad), in his writings to describe the unification of separate elements into a whole while maintaining that they remain separate, that they can never attain sustained balance. Kandinsky sought throughout this oeuvre to unite the most diverse phenomena, seeing opposition and conflict as essential constituents of that unity. Thus, of the laws in nature and art, he wrote in Point and Line to Plane: ‘we now discover again the law of opposition and of juxtaposition. This law gives rise to two principles – the principle of parallelism and the principle of contrast.’21 Laws of opposition and contrast recur through the writings from 1910, and map directly onto the principles of juxtaposition and opposition that, as we have seen, Kandinsky came to formulate for the synthesis of the arts. Thus, the unity that Kandinsky seeks may be seen as one of disunity. Repeatedly he sought motifs that embodied such unity. A good visual example is found in the painting Dominant Curve, 1936 (fig.3) in which we see, to the right, a form derived from ‘Schröder’s Staircase’, a reversible figure devised before 1870 and widely reproduced in psychology textbooks,22 which can be read in spatially contradictory ways (a plane read as an ascender can also be read as a tread-board, though not quite simultaneously). In this work and others like it – and there are a number in Kandinsky’s oeuvre – two contradictory readings of spatial relations are possible as, within an instant, that which was depth becomes surface and vice versa. One form, two contradictory readings. The same was said of the point as it was momentarily both punctuation and free graphic form. The passage moves next to a consideration of a point’s external boundary, and describes ‘different shaped points’.25 Fig.3 of the volume (fig.4) offers a series of twelve of these. One is round; most have clearly circumscribed edges; some have quite erratic, ‘open’ edges which allow the ground to appear within the outer extremities of the point. In the latter – particularly in the case of the ‘point’ composed of vertical and horizontal lines – the relation of the figure to its ground is less clear. 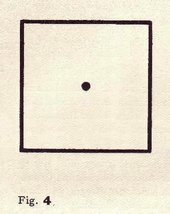 Fig.4 (fig.5) offers a perfectly round point at the centre of Kandinsky’s Urbild. 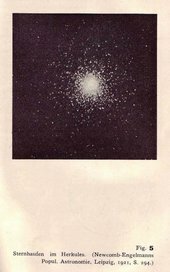 Fig.5 (fig.6) offers an image of that point exploding, dissipating across the picture plane in a series of tiny points. These threaten to classify the relatively enormous central point as a plane, and at the boundary of the point (actually, the centre of a nebula in Hercules, according to the caption) the edge is effectively dissolved. Thus, the distinction ‘figure/ ground’ is all but lost as the identity of the central point is twice undermined – as a point that becomes a plane because of its size, and by its diffuse edge which the ground invades. Here the dual (and contradictory) identity of the point illustrates the concept of the Doppelklang. The boundary is a fundamentally important motif for Kandinsky. It is that which divides one thing from another, whether a point from its ground, one art from another, or a nation from its neighbour. It is a site simultaneously of differentiation and of unification. In this, the graphic boundary has the same function as the full-stop as accounted for in Point and Line to Plane: the stop is a ‘symbol for interruption, for non-being’ and simultaneously a ‘bridge from one entity to the next.’ Like the point in a sentence thus characterised, the graphic boundary is that which simultaneously separates and unites. The parallel and oppositional dynamics found within the album Sounds constitute one moment in the process that leads to the realisation of such ambition. 1. Kenneth Lindsay and Peter Vergo eds., Complete Writings on Art, London, 1982, p.818. 8. See Christopher Short, ‘Kandinsky’s Art Theory 1909-1914: The Relation of Texts to Sources’, unpublished M.A. Dissertation, University of Essex, 1988. 9. Lindsay and Vergo 1982, p.250. 10. Peter Vergo, ‘Music and Abstract Painting: Kandinsky, Goethe and Schoenberg’, in Towards a New Art. Painting 1910–20, London 1980. 11. Lindsay and Vergo 1982, p.147. 17. Andrew Glew, ”Blue Spiritual Sounds,’ Kandinsky and the Sadlers, 1911–16’, The Burlington Magazine, vol.139, September 1997, p.602. 18. See Lindsay and Vergo 1982, p.168. 22. Sixten Ringbom, The Sounding Cosmos. A Study in the Spiritualism of Kandinsky and the Genesis of Abstract Painting, Abo, 1970, p.190. 23. See Lindsay and Vergo 1982, p.544. 25. The same move is made in the passage on line, where the outer edges of the line are described as a ‘special sound-factor.’ Here, the two edges are defined as ‘independent external lines’ and can be ‘smooth, jagged, perforated, rounded’ (p.610). The same is addressed in the section on Plane, as the unity of the picture plane is divorced from the surrounding world by a ‘certain resistance’ as one approaches the boundaries. This paper is based on a talk delivered at a symposium titled Abstraction Across Media: Wassily Kandinsky, held at Tate Modern, on 30 September 2006, during the exhibition Kandinsky: The Path to Abstraction, Tate Modern, 22 June – 1 October 2006. Christopher Short is Senior Lecturer in History and Theory of Art and Programme Director of MA Fine Art at Cardiff School of Art and Design. Christopher Short, ‘Between Text and Image in Kandinsky’s Oeuvre: A Consideration of the Album Sounds’, in Tate Papers, no.6, Autumn 2006, https://www.tate.org.uk/research/publications/tate-papers/06/between-text-and-image-in-kandinskys-oeuvre-a-consideration-of-the-album-sounds, accessed 19 April 2019. Press release: Important Kandinsky letters and poems fully published in English for first time, coinciding with major Tate Modern exhibition.